It’s not uncommon to find a young boy holding a wild animal close to his heart. 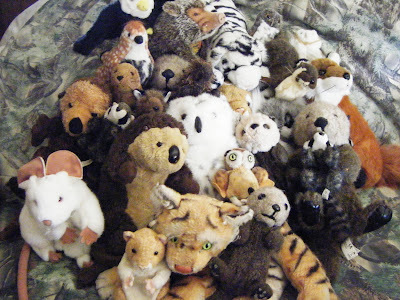 Lions and tigers and bears — among other stuffed animals — are beloved by “kids” of all ages. My husband still has scores of his childhood friends whose fur coats resemble that of the latter-day Velveteen Rabbit. A lucky few (see: Toy Story) reside alongside our son’s prodigious wildlife collection today. But 3-year-old Lucas Engles-Klann’s adoration of animals goes well beyond inanimate objects-of-affection. Which is why the self-proclaimed vegetarian is hosting his second annual Woodland Park Zoo fundraiser, to be held Sunday June 28th from 3 to 9 p.m. at Elemental and Elemental Next Door. Domestic wildlife, beloved by kids of all ages. 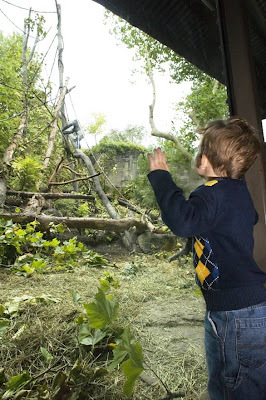 Lucas’s 2008 “Dine Out for Animals” event at Georgetown’s Hangar Cafe was so successful — raising $1200 for improvements to an existing gorilla exhibit — it bought him an invitation to the zoo’s improved-habitat debut and the gift of a gorilla footprint, now holding an esteemed place in his animal-filled bedroom. Lucas at the zoo, watching Calaya enjoy her new “playground” funded by his efforts. The cost for the Elemental event (food, wine and tax included) is $50 per-person and proceeds will help fund habitat improvements for primates at the Woodland Park Zoo — including the exhibit housing Lucas’s special friend, Nina, matriarch of the gorilla clan. So, how does a pre-schooler host a zoo fundraiser? With the aide of his parents, of course. “Last year, when we asked him what he wanted for his birthday, he said he wanted to adopt all the gorillas in the zoo,” explains his mom, Jennifer Engles-Klann. And when she and her partner Stephanie Engles-Klann told him they didn’t have enough money to adopt all the gorillas available through the zoo-parent adoption program, he said, “Get some.” So they figured out a way to do so. Finding a place to host a fundraiser was easy, thanks to their industry contacts. Jennifer is a lead server and wine-captain at Wild Ginger and her partner, Stephanie, works for Vinum, a wine import and distribution company. Together they have many friends happy to help their young son’s cause. Their pal Justin Taft donated the Hangar Cafe space in Georgetown last year. This year, Phred Westfall and Laurie Riedeman are donating their time, talent and Wallingford restaurants for the fundraising open house. The menu, taste-tested by Lucas, will include no meat but will (he hopes) include avocado shakes. “As soon as Lucas realized meat came from animals, he didn’t want to eat it,” explains Jennifer. His meat-eating parents obliged. Then, last year, as they were driving home from a visit to the zoo, he posed a question. “He asked us if we liked animals,” his mother recalls. “And when we said we did, he said, `Then stop eating them!’ You can’t argue with that!” Theirs is now a vegetarian household. Gordon goes everywhere with Lucas, and even paid an emergency-room visit to Seattle Children’s on Halloween when the boy, dressed in a gorilla costume, was suffering from croup. And when I asked him to tell me why he chooses not to eat meat, he didn’t pause for a moment. “I don’t eat animals because they’re my friends,” he said. And who can argue with that? Lucas enjoys a quiet meal with his friends at the Hangar Cafe. For more information on Dine Out for Animals, contact Stephanie Engles-Klann at stefek07@yahoo.com.